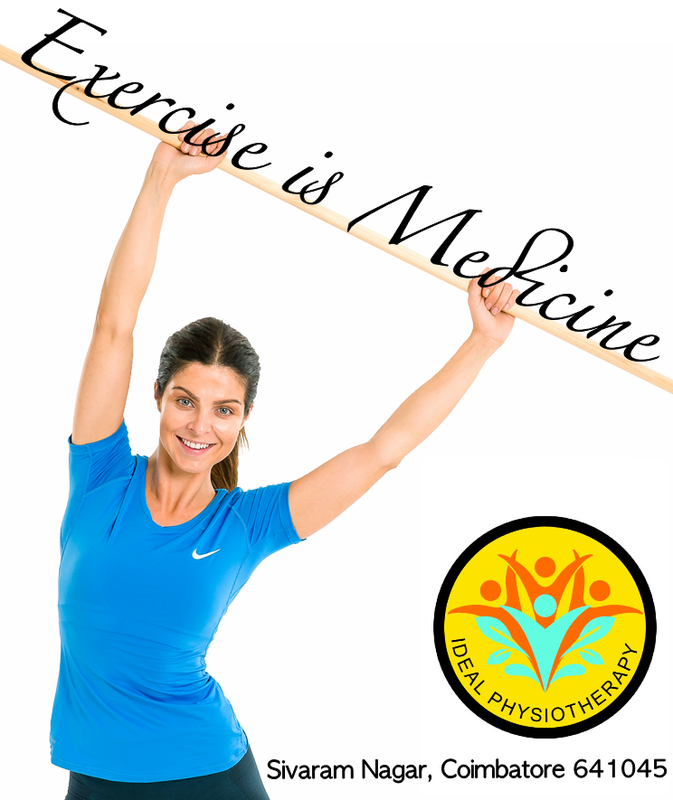 What we treat in Ideal Physiotherapy Centre? At Ideal Physiotherapy Clinic we treat a variety of conditions which span all age groups. Why I am Not Losing Weight!!! Remember when you are hungry but actually angry? There is a term for that called hangry! The anger is an emotional or mood specific response to hunger, something controlled by hormones. So when hunger can make you angry, imagine what would be actually transpiring inside. 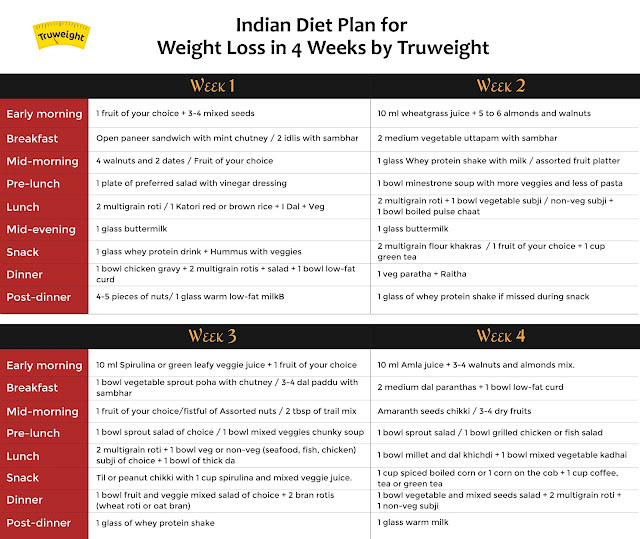 Any Indian weight loss diet plan cashes in on this and makes you eat often to prevent hormone and enzyme spikes. It is proven that hormones can either make you fat or even result in weight loss. Ever heard of leptin, ghrelin, stress hormone, thyroid hormones, insulin? Well, all these form a complex hormonal cocktail that greatly influences hunger, feeling of fullness, even fat storage pattern and places! Sounds freaky, doesn’t it? Well, the good part about it is, you could influence some of them (for example insulin, stress hormones etc.) 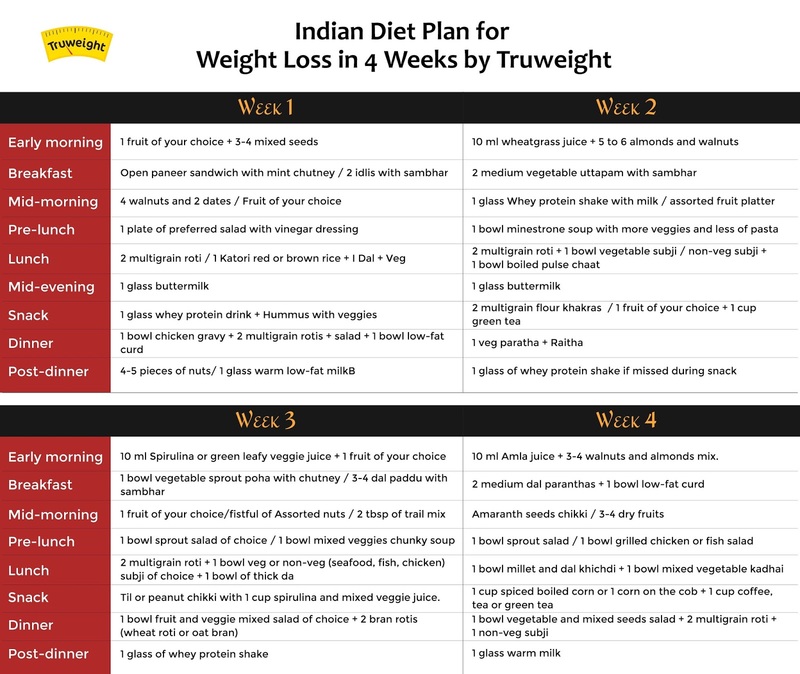 with a good dieting chart. So you thought that burger hurts your waistline by only helping you pile on the calories? Well, think again! Studies are abounding that find nutrients such as vitamin D, calcium, B-complex vitamins can influence your weighing scale readings. Time to look at food in a more wholesome manner (like a healthy Indian diet) than just calories, cheese, butter, oil, fat etc! What are toxins? Everything around us; be it the pollution, smoke, food colours, food additives, plastics etc are all toxins and one of the obesity causes. Research finds that excess exposure to toxins make our body store it in small fat pockets. Yes, that is fat and toxins being stored in the body. If you sleep less then your body tries to cope up with the related exhaustion in multiple ways. By increasing secretion of stress hormones, making you susceptible to infections among other things. The result, weight gain. Stress is like this enemy which weakens your body from all angles. Not only does it release hormones which result in fat storing but you tend to reach out to sugar and salt laden foods to comfort yourself. So even if you’re on any Indian diet plan to lose weight, lack of sleep can still keep you fat. Read more about these 5 lesser known causes of obesity and how to tackle them. 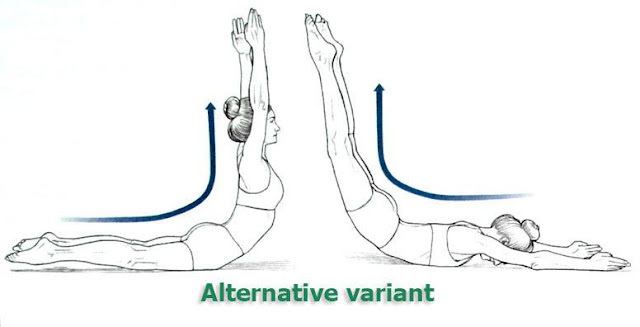 Our aim with these planned series of back straightening exercises is to give you with an exercise program, which when practiced regularly, will help you get rid of round back and discomfort in the spine and give you an optimal posture. If you are diagnosed with a spinal or back injury, consult with your doctor if this exercises are suitable for you. Initial position. Start with your hands and knees on the exercise mat. Your knees should be directly below your hips and your palms under the shoulders. 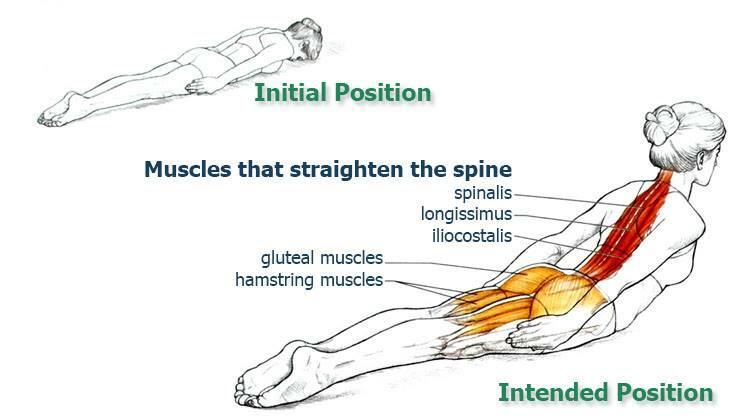 Keep your pelvis and spine in a neutral (straight) position, by engaging your abdominal muscles to support your spine. ● Return to starting position. Repeat 5 times. Initial position. Lie on your stomach and put your forehead on the exercise mat. Place your arms at your sides and press your palms on the thighs. Straighten your elbows. Put your legs together drawing out the toes slightly. ● Inhale. Slowly lower the trunk and head to the initial position. Repeat the exercise 10 times. * Please make sure to start from the 1st exercise and only after perfecting it work your way up to the more demanding ones to ensure a gradual progression and avoid any injuries. Initial position. 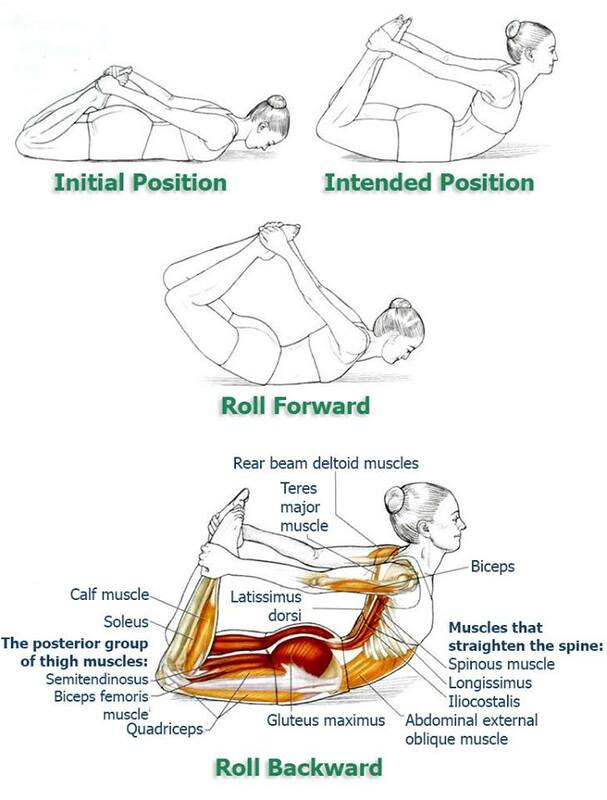 Sit on the mat and straighten your back. Stretch your legs in front of you and place them apart – slightly wider than shoulder width. Toes are pointing upward (dorsiflexion). Lean straightened hands on a mat near the pelvis. 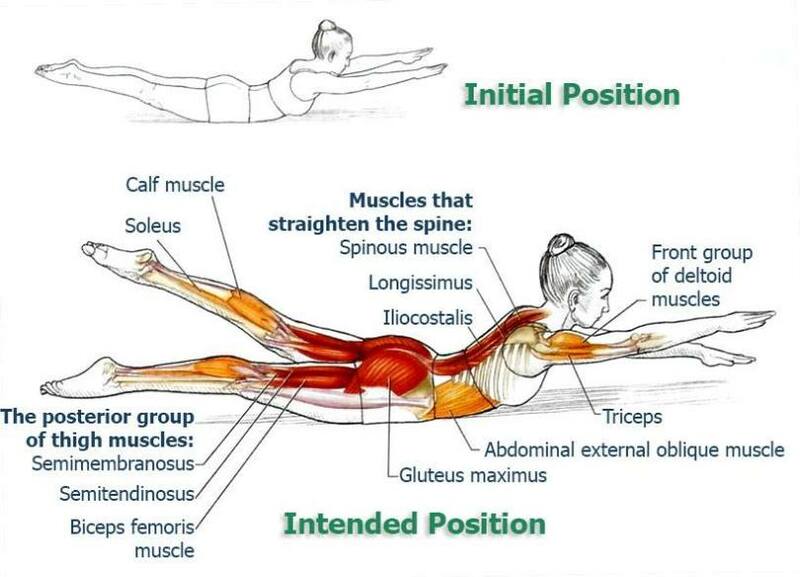 ● Straightening your body, return to the initial position. 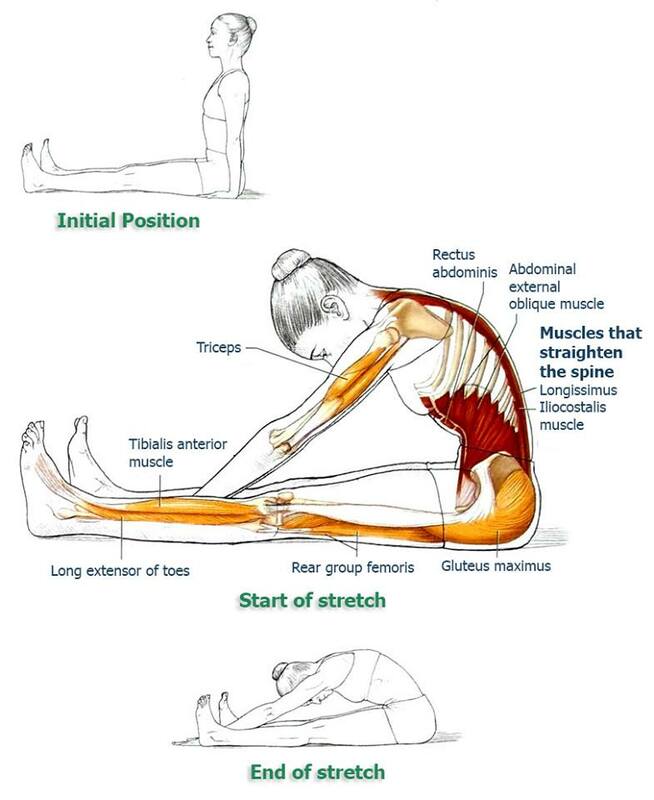 Repeat the stretch 5 times. In a supine position (on your back, face up), bring your knees to your chest. Hold the stretching position with medium to strong intensity. Avoid sharply increasing the intensity of the stretching. Keep the chest straightened, shoulders relaxed and the shoulder blades together. Breathe freely. ● Exale. In the same energetic movement straighten your leg at the knee, bending the other one and going for the buttocks. Repeat the exercise 20 times (10 per leg). Initial position. Lie on your stomach, putting your chin on mat. Bend your elbows and bring your hands behind your lower back. The hands should lie on the sacrum. 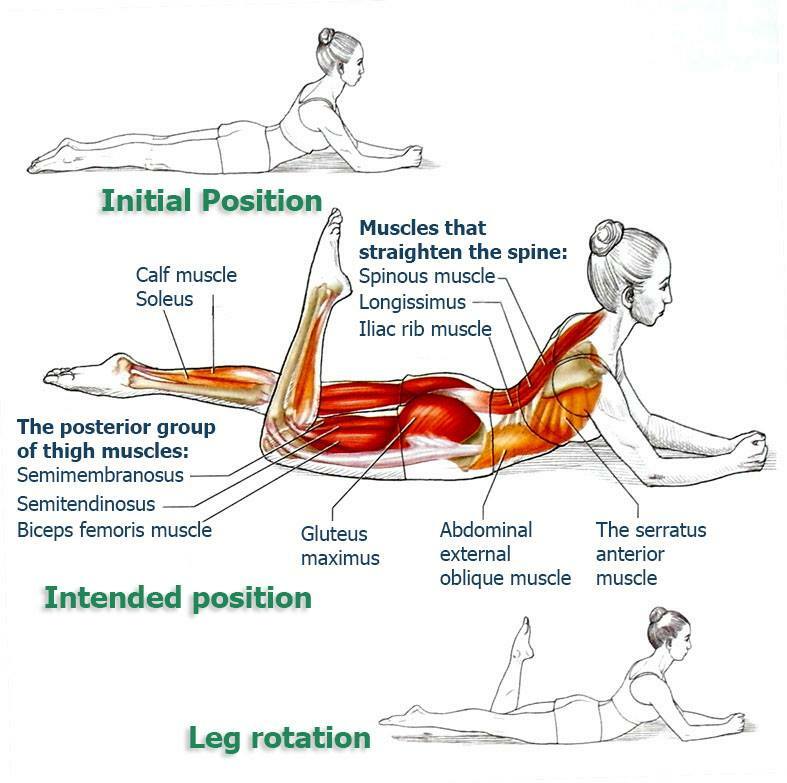 Lift both legs approximately an inch (2-3 cm) from the mat. Straighten your knees and gently pull the toes. ● Lift the chest off the mat, straighten your arms at the elbows, turning the back of the hand towards the feet. Simultaneously, straighten your knees, trying to lift them as high as possible off the floor. 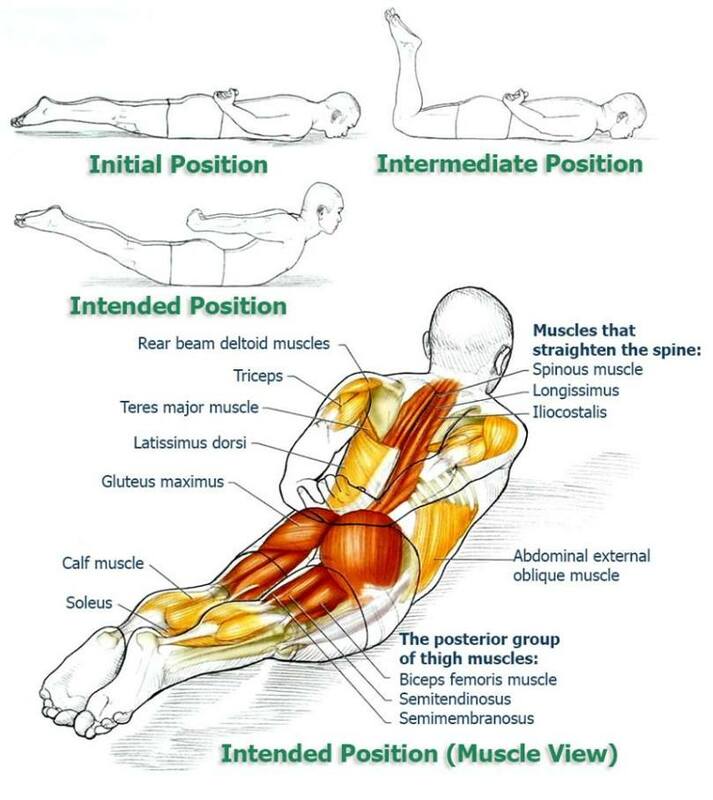 Hold the position briefly then return to the initial position. Repeat 6 times. Initial position. Lie on your stomach, stretch your arms in front of you, palms facing downwards. 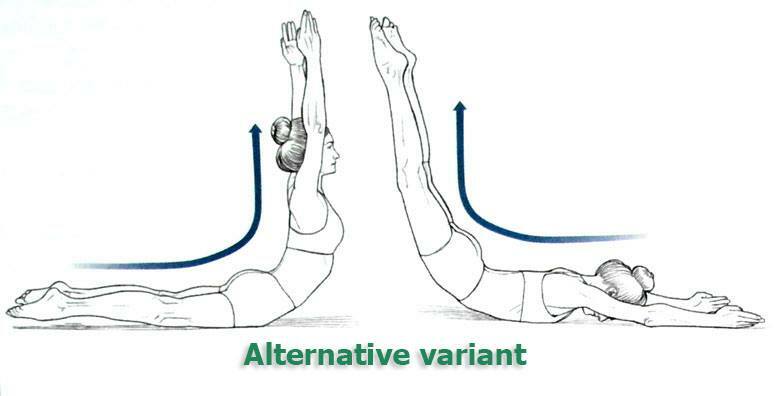 Slightly lift the chest, arms and legs of the mat. Keep the legs and toes extended. ● Then raise the left arm and right leg, while returning their opposite to their initial position. Continue the exercise for 10 exchanges. The exchange of the opposite limbs is quick, but smooth. Initial position. Lie on your stomach, bend your knees and bring them on your hip. Take hold of the feet with your hands, as shown in the figure. Now, lift the head, chest and knees on the mat. ● Breathing out, roll in the opposite direction, from your stomach to the pelvis. Repeat the exercise 10 times. ● Breathing in, roll back into the intended position. Repeat 5 times, accompanying the rolls forward with exhalation, and the rolls back with inhalation. Diving Swan can also be performed by raising his hands above the head rather than keeping them wide apart, as shown in the illustration above. The same hand position is maintained on the reverse roll as well. 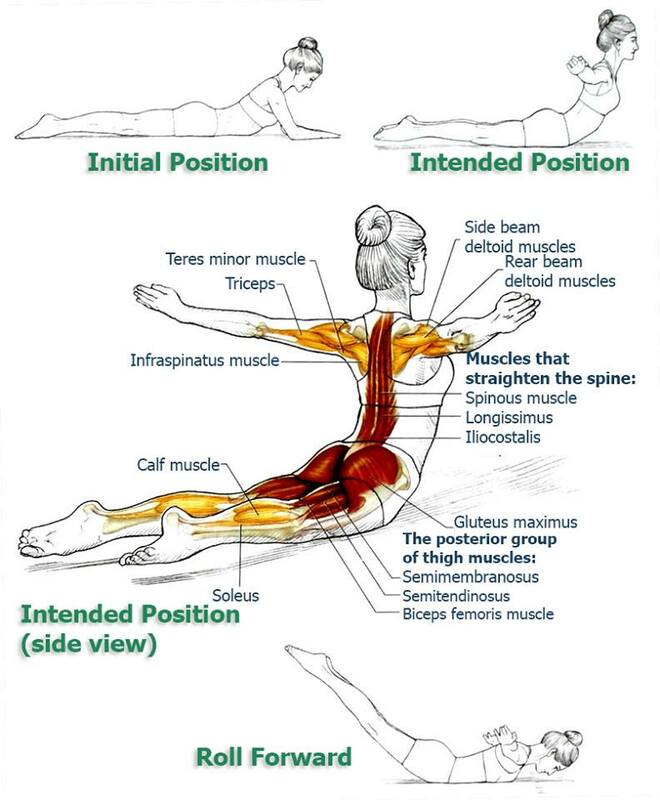 This increases the load of spine extensor muscles, but also helps to maintain a uniform curvature of the spine during the rolls.